Quebec Liberal Leader Philippe Couillard presents his party's financial platform in Montreal, on Sept. 12, 2018. 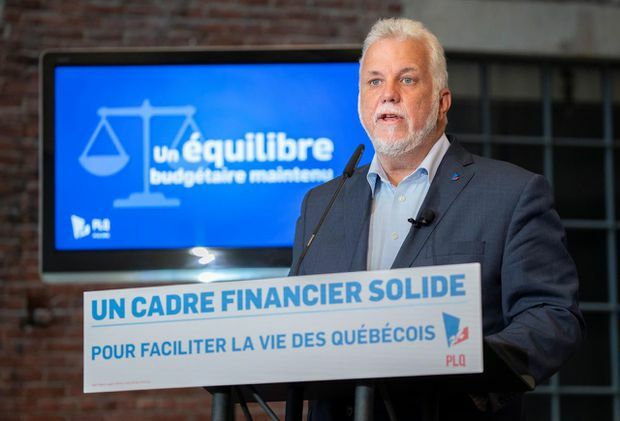 A re-elected Quebec Liberal government would ensure several more years of balanced budgets, Philippe Couillard promised Wednesday as he announced his party’s financial framework. Mr. Couillard said his government wouldn’t have to dip further than already announced into a reserve fund despite some $2.4-billion in election pledges through 2022-23. As the campaign moved past the midway mark, the Liberals explained they are counting on using an estimated $950-million annual surplus to fund some of their promises. Mr. Couillard said his party is also banking on higher levels of own-source revenue – which comes from sources other than Crown corporations and federal transfers – based on projected gross domestic product growth. As outlined in their budget last spring, the Liberals would take $1.6-billion from a special reserve fund to balance the books this year and $936-million and $479-million the two following years. It also identified some $250-million in “potential” savings from a review of government spending. The Liberals are now projecting economic growth of 2.3 per cent in 2018 rather than the previously expected 2.1 per cent, which they say will allow the province to pocket an additional $200-million. The party is also proposing to boost its education and health budgets by a minimum of 4 per cent and 4.2 per cent, respectively, over the course of its mandate. Mr. Couillard described his plan as a “prudent” one that includes only money the province currently has available. He said it also accounts for possible disruptions to growth such as a looming labour shortage and the growing trade rift between Canada and the United States. Parti Québécois deputy leader Véronique Hivon was among the first to criticize the new plan, which she said contained insufficient funding for seniors and daycare-aged children. Ms. Hivon said there’s a “crying need” for more funding for seniors after years of Liberal cuts to health services. “I think it’s the worst message we can send to seniors today that austerity will still be there for them after they lived such difficult moments, such difficult years with the health cuts that touched them personally,” she said in Montreal. The party also accused Mr. Couillard of being “dishonest” by using growth projections that were in some cases higher than those presented in a pre-election report that received a stamp of approval from the province’s auditor-general. The Coalition Avenir Québec presented its financial plan last weekend and promised to increase health and education funding without raising taxes beyond the level of inflation. François Legault’s party forecast balanced budgets, with spending growth of 3.5 per cent in education and 4.1 per cent in health. On Wednesday, Mr. Legault attacked the Liberals for promising to return only $1.2-billion to Quebeckers, compared with his party’s planned $1.7-billion.